With the revival of the Art Deco classics of the 1930’s the cushion cut diamond has garnered a great amount of attention and popularity. This specific diamond cut was very popular in the 19th century and were cut primarily by hand. They were characterized by appearing as a cushion shaped pillow. Many were classified as Old Mine Brilliants that were identified by large “chunky” facets, medium to large culets; crown angles over 40% and small tables. With the increased demand and higher price points obtained for the modern round brilliant diamond many of these cushion diamonds were re-cut and gradually disappeared from the market place. What remained were primarily the lower colored diamonds that ranged from K thru O that had small hints of yellow within their body of color. With present day technical advancements, a select number of specialized cutters have created a modern version of the cushion cut diamond. 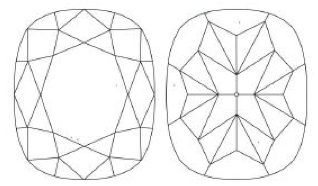 Unlike many other Fancy Shape Diamonds (Asscher, Radiant, Emerald, Ovals, Princess-Cut, Pear Shape, Marquise, and Heart Shape), Cushion Diamonds offer to the consumer various options that involve different patterns of facet alignment cuts and ratios. The aim of this tutorial is to present to the reader the gemological knowledge necessary with which to make an intelligent decision in regards to their eventual choice. Diagrams and explanations of the cushion cut diamond along with videos and photos will be highlighted. 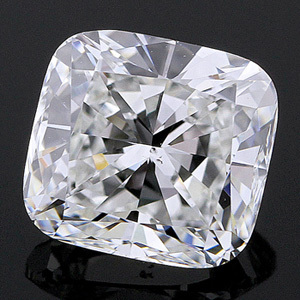 Cushion Cut Diamonds are presently identified in the market place by the various names below and each has particular characteristics that are specific to their cut. I will be posting a diagram of a cushion and then identify the components of the diagram for the viewer followed by diagrams of each different cushion cut and a picture and video of each. Another component to review is the table size and depth. You may notice that the diagrams of each cut have different table sizes and depths. This is driven again by the length of the pavilion facets and in turn the overall brilliance of the diamond. In the “crushed ice” cushion most table sizes will range in the upper 50’s to middle 60’s range. 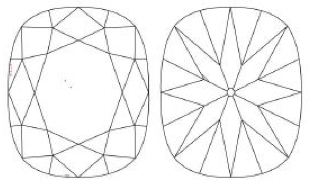 As the focus of the brilliance is the center of the diamond as opposed to the entire diamond, the cutter can reduce the table size as the viewer is primarily directed to look at the intensity of the brilliance coming from the center of the diamond. The tradeoff is the lack of overall brilliance or broad white light throughout the entire diamond. When viewing diagram B notice that though the primary 4 pavilion are present similar to the “crushed ice” diagram, they have been lengthened. 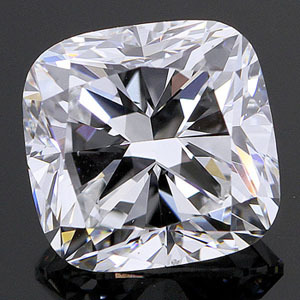 This has created the appearance of an “X” facet through the center of the diamond. In gemological terms these are still considered cushion modified brilliants. Please notice that they now reach to the edges of the crown and touch the girdle. The effect of this is that the brilliance has reached the 1,11,5 and 7 o’clock positions thus creating more of an overall white light brilliance. By adding the smaller facets to the 3, 6,9,12 o’clock positions an extra amount of brilliance has been added to the center of the diamond. You will also notice that the size of the table has been increased. The larger table permits the pavilion facets brilliance to reach all sectors of the diamond. As previously mentioned 98% of the cushion diamonds cut are of the “crushed ice” variety. Primary reason being the potential extra weight gained and higher profit margins. However to the educated consumer whose interest lies in achieving greater brilliance in their diamond purchase, the “X” factor cushion provides an option for this desired result. As there is a larger loss of weight with this cut, the cost of a similar cushion diamond in terms of weight, color and clarity is higher. Viewing the diagram B will indicate where this loss of weight stems. Notice that the area along the girdle edges is no longer free of facets but contain the extended pavilion facets. In appearance as viewed from the videos presented the diamond now has more of an overall white light brilliance as opposed to the primary center brilliance of the “crushed ice”. 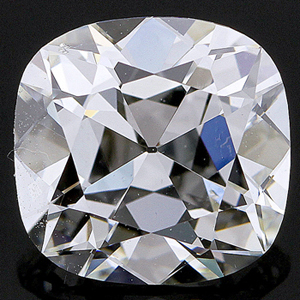 In reviewing this cutting style diamond as in the “crushed ice”, the depth should be in the range of 69.9 to 62%. Lower than this 70+ will create too much depth below the girdle and the consumer will be paying for weight that cannot be seen. Above the 62% and the diamond can become watery in appearance thus reducing brilliance. Unlike the “crushed ice” cushion the table can be increased to the 60-66% to allow the 4 pavilion facets full opportunity of displaying brilliance. The term Antique style cushion refers to the cushiony or pillow look of the diamond as stated in the opening paragraph. The popularity of this cut has increased dramatically over the last 3 years. However due to the rapid increase of the rough material, production has not been able to stay in line with demand. In viewing diagrams 3 and 4 please notice the changes that have occurred in the number of pavilion facets. In effect they have doubled from 4 to 8. Understanding the role of the pavilion facets in the overall brilliance of the diamond leads one to estimate correctly that the brilliance in the diamond will now be increased two fold. In addition other factors such as table size and higher crown angles will have an added effect of producing greater brilliance. To define these added features it is important to understand the role of the term brilliant and why I have broken down the antique cut to two different terms of old mine brilliant and cushion brilliant. 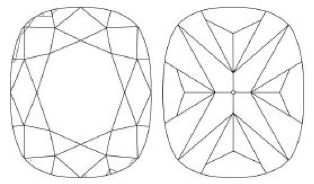 GIA has determined that if the diamond meets 3 out of 4 of these categories then the shape can be defined as Old Mine Brilliant. If 2 of the 4 are met then the shape of cushion brilliant will be listed. With either shape variable the cutting style has not changed. As the round brilliant diamond has the most saturated brilliance of all the diamond shapes it is easy to conclude why the cushion with its close similarity of cutting style to the round and antique look has attained its present day popularity. Let’s review how the basic features affect the brilliance of the diamond. As its been stated earlier, the primary source of the brilliance in this shape is derived from the extended pavilion facets and in this case reaching all the primary areas of the diamond both through the crown and pavilions areas. As in the round diamond, a smaller table will allow the crown angles to increase and thus more natural light will be offered to the diamond. The effect is the broad white light reaching the extended areas of the crown when viewed from the top of the diamond. The crown angle statement as noted above defines the cutting style but whether the angle is 35 or 42% or in between, the crown angles are heightened to permit more brilliance to penetrate. The medium to large culet has no effect on the brilliance of the diamond but rather serves as an identifier for the cutting style. In addition it allows the facets a starting point to extend the size of the 4 main facets within the 8 facets. Note how the facets start from the center and extend outward with their size determined by the culet. The other cushions primarily show a culet stating none or small and the facets are much smaller. Based on individual diamonds the variables in table can be as low as 45% and as high as 58%. The depths will usually stay constant in the 65-69.9% range. Focusing on these numbers will increase the possibility of obtaining a diamond with the most brilliance. 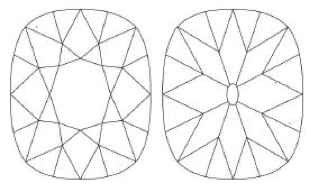 As a round diamond is the only shape that has a defined cut grade it is important to understand the focus of this tutorial when researching a cushion diamond. On many occasions the term polish and symmetry are used in determining the cut grade of a cushion. Though helpful the table and depth measurements are far more useful as the polish and symmetry are rated as a Finish grade and not cut.. Ratings from Excellent to good will vary for polish and symmetry with the obvious excellent/excellent rating considered the best. However this is extremely hard to find and in these situations where it has been highly rated the cutter will attach an extra fee though it may not be warranted for the brilliance of the diamond. The beauty of the Antique cushions is their uniformity of white light, brilliance as witnessed in the above videos and photos. However as the rough material is very similar to the round octahedral in appearance and cost, these cushion diamonds are not for every consumer as the costs are higher. The variables in final cost can increase by 20% for like kind color, clarity and weight. The weight loss in cutting these diamonds to maximize their brilliance is much greater than the previously mentioned cushion cutting styles. Availability is another factor to consider as many times there may be only 1 or 2 diamonds to select from in your budget parameters as opposed to a larger selection of the other cushion styles. Another unique aspect of the cushion diamond is the variables that are available in the ratio of the diamonds. By dividing the length by the width of the diamonds millimeters you can obtain the desired ratio of your diamond. Numbers that are within 1.06 ratios are considered square and are the most in demand ratio of the various cushion cutting shapes. Ratios varying from 1.07 to 1.13 are neither square nor rectangular. Ratios larger than this can be viewed as rectangular and become increasingly difficult to obtain s these ratios are usually found in radiant or oval shaped diamonds. 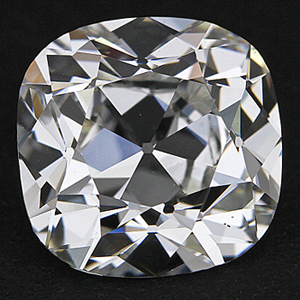 Numbers over 1.25 will give the cushion the appearance of an oval diamond and are not recommended. These ratios are personal choices and help determine the style of the engagement ring. The focus of this tutorial has been through the use of video, diagrams and photos to introduce you to the world of cushion cut diamonds. The choices in selecting a cushion have hopefully been explained where an intelligent decision can be reached. With the abundance of information available we have tried to narrow the scope of the options and specified the variables within each cut. With their present day popularity many consumers are finding that for various reasons they are being drawn to this shape. On many occasions the majority of new engagement rings coming into the market are shown with this center diamond shape as the focus. We hope that with this tutorial your search will now contain a better perspective in your determination for the perfect cushion cut diamond that best fits your personality.